Is this the sweetest championship of them all? And more pointedly, could it be the last of an era? Take a good, long look at pro football's acknowledged greatest dynasty, one equally revered and reviled. It started out 17 years ago when, as lovable 14-point underdogs, the New England Patriots pulled off one of the game's biggest upsets. Now, with their record-tying sixth Super Bowl title in their record 11th appearance, they may have earned their final acclamation against a team that was seeking to avenge that very loss in 2002 that started the Patriots on their path to greatness. In the Boston Globe's Never Gets Old, New England fans far and wide can savor this sixth championship, earned in spite of the usual accompanying distractions. There were questions about the quarterback: was he finally too old, at 41, to carry what some saw as a mediocre team? But those who were convinced by reports that a major rift among New England's holy trinity of owner Robert Kraft, mastermind Bill Belichick, and field marshal Brady—first reported last season—would deter them from their appointed task, simply hadn't been paying attention. This triumvirate tunes out the noise and shows its opponents how the game should be played. Relive every moment of the 2018 regular season and 2019 NFL playoffs, from opening kickoff to the latest hoisting of the Vince Lombardi Trophy. There's also a comprehensive Super Bowl retrospective section, which chronicles all 11 of the Patriots' appearances in the big game since 1986. 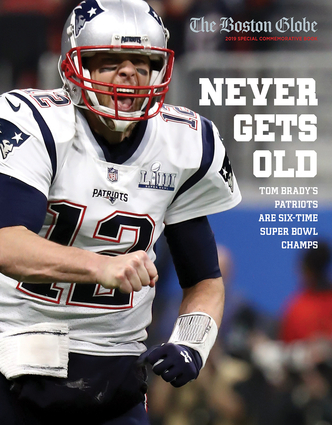 With its vibrant color photographs, essential statistics, memorable quotes, and acclaimed commentary by some of the nation's best sportswriters, this book is the ultimate New England Patriots keepsake. Never Gets Old takes you inside the legacy and behind the scenes on an all-access pass, providing commentary and insights on Brady, Belichick, All-Pro cornerback Stephon Gilmore and the rest of a roster that silenced the doubters once again. And it fully commemorates what Patriots Nation has known for most of the 21st century: This is a team for the ages. The Boston Globe was founded in 1872 and is the recipient of 23 Pulitzer Prizes. It is based in Boston.